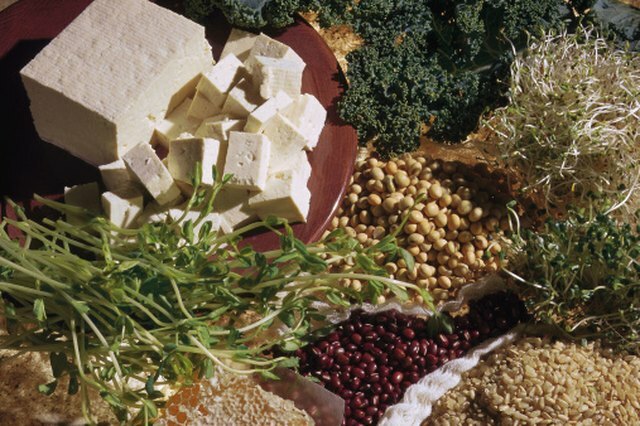 Tofu is a soy curd product that has been consumed for thousands of years. It has grown in popularity due to its high nutritional value and for its use in vegetarian diets. Tofu can be be preserved by freezing for up to 5 months. Freezing has the added benefit of making tofu chewier so that its texture is more meat-like when thawed. 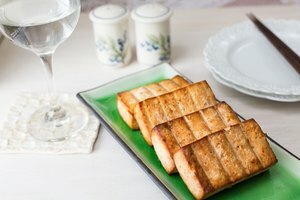 Frozen tofu is easy to thaw and will absorb marinades more effectively than tofu that has not been frozen. 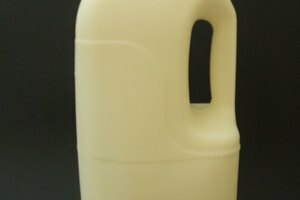 Remove the tofu from the freezer and discard the packaging. Place the frozen Tofu on a paper towel in the middle of a microwave-proof dish. Microwave it on high for 60 seconds or until defrosted. Check regularly by piercing with a knife. If the block has defrosted, the knife will pass through the tofu with ease. The tofu should be soft but cool to the touch. If your microwave does not have a rotating center plate, be sure to rotate the container containing the tofu periodically so that the tofu is defrosted evenly. Place the tofu in a pot of warm water. Bring the water to a boil and simmer it on medium heat for 5 to 25 minutes. The time required to defrost the tofu will depend on the size of the tofu block. Check for doneness every 5 minutes by gently poking the block with a knife. 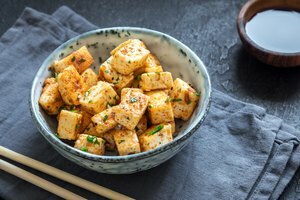 Leave the frozen tofu on a plate in the refrigerator for approximately 5 hours or overnight if you want to use the tofu in a meal the next day. Do not remove the packaging. Use a knife to test the tofu after 5 hours to determine if it has thawed. If you use the microwave method to defrost tofu, you may want to use a 50% or defrost power setting if your microwave has one. It may take longer for the tofu to thaw this way, but a lower power setting is less likely to overheat the tofu around the edges, which can sometimes happen when microwaving items even for a short period of time on high power. Start with 1 minute on a lower setting and check for doneness with a knife. Continue defrosting in 1-minute increments until the tofu is completely thawed.